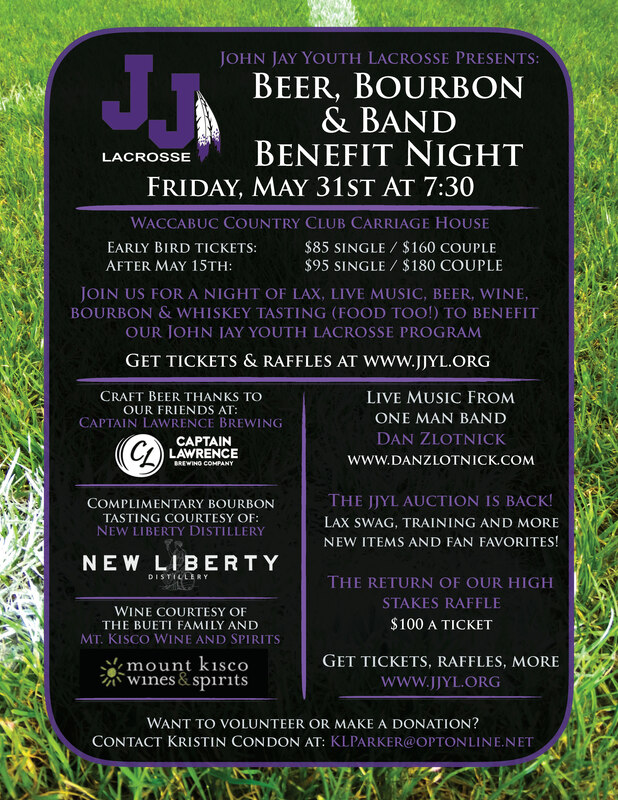 Sign up for the JJYL Beer, Bourbon & Band Benefit Today!!!! John Jay Youth Lacrosse is a (501c3) non-profit organization established in 2002. Any resident of the Katonah-Lewisboro school district is eligible to register and play. We offer programs for girls and boys in grades K through 8. Questions can be addressed to: . JJYL families and friends - we are giving our dinner and auction a makeover this year - more fun, more booze, more auction items and even some great live music – all to benefit our youth program. This will be a great night for current and past JJYL families to come out for a great cause. Early bird ticket pricing is in effect until May 15 - so don't wait to get your tickets! We are looking for donations from our members too - if you would like to donate auction items or services and/or a bottle of rare wine or whiskey, etc – or volunteer to help – please contact Kristin Condon at klparker@optonline.net.